Der Artikel Eleventh Dream Day: Eighth wurde in den Warenkorb gelegt. 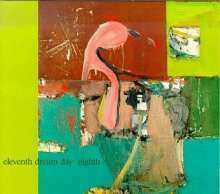 Eleventh Dream Day -is Rick Rizzo, Doug McCombs, and Janet Beveridge Bean, often augmented by John McEntire on Keyboards, or Ira Kaplin or Tara Key on guitar. In recent recordings such as 1995's Orange Moon 7", Ursa Major and Eighth, Eleventh Dream Day are loose and open. The Band's focus is no longer on performance of songs but of interpretation of the same. The open structure of band allowes them freedeom to experiment. It has also given the members time to work on their own projects; McCombs - Tortoise, Beveridge Bean - Freakwater, and Rizzo on solo guitar working with Tara Key, Edith Frost, Smog and Palace among others. The narrative style of lyrics have shifted within the songs to a more prominent position- a result of the more open song structure. The musical output of Eleventh Dream Day is no longer the tight carthartic band of a decade ago; however their vocabularly of sounds are now richly diverse. Focus on the continued expansion of said vocabularly, and exploration of different interpretations by each of the musicians of the same, provides the essential and compelling force to their contiued existance and a creative unit or band.